Dr. Thornton was born and raised in San Diego, California where she developed a passion for horses from a very young age. After hours spent at the barn and weekends devoted to horse shows, she earned her United States Dressage Federation Bronze and Silver Medals before the age of 20. 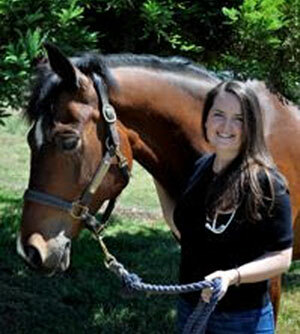 It was her experiences in the show ring that ignited her interest in sports medicine and rehabilitation. Dr. Thornton attended both undergraduate and veterinary school at UC Davis. As a veterinary student, she studied under Dr. Sue Stover conducting research on the effects of synthetic footing surfaces on the distal limb kinematics of dressage horses. This work was presented at the International Conference on Equine Exercise Physiology (2014), the American Association of Equine Practitioners Conference (2016) and featured in the publication The Horse (2016). Following vet school, Dr. Thornton accepted a one-year internship position at Fairfield Equine Associates in Connecticut, under the mentorship of Drs. Richard Mitchell and Ryland Edwards III, where she gained experience in sports medicine, lameness and general care of the performance horse. This experience also gave her the opportunity to spend time in Wellington, FL with intensive exposure to sports medicine in the show circuit and FEI setting.